Giovanni Cosmetics is an Eco-friendly, free of Sodium Sulfate (SLS) and free of Sodium Laureth Sulfate (SLES), Phthalates-free, Paraben-free, Vegan brand that does not test on animals. 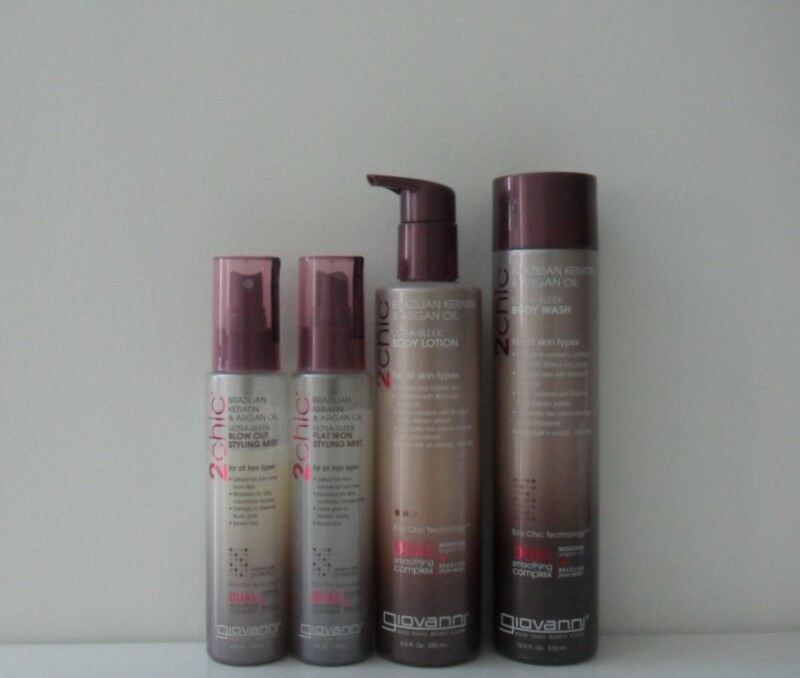 Their Eco Chic Hair Care has a range of lines targeting specific hair care needs. They’ve got Ultra-Sleek (Moroccan Argan Oil + Brazilian Phyto-Keratin), Ultra-Moist (Avocado + Olive Oil), Ultra-Volume (Tangerine Butter + Papaya), Ultra-Luxurious (Cherry Blossoms + Rose Petals), Ultra-Revive (Pineapple + Ginger), Repairing (Blackberry + Coconut Milk), and Frizz Be Gone (Shea Butter + Sweet Almond Oil). I’ve tried the Purifying & Exfoliating Facial Cleansing Towelettes (mostly because of the really cool all-black packaging) from their D:Tox Sytem (Facial Care) purchased from Drugstore.com ages ago but other than that, I’ve never really tried anything from this brand before. That said, I have seen their adorable Flight Attendant Travel Kits being sold at Sultan Center (Salmiya) but since this is a somewhat “natural” brand, I didn’t know how long they’d been sitting out there fore (probably expired). 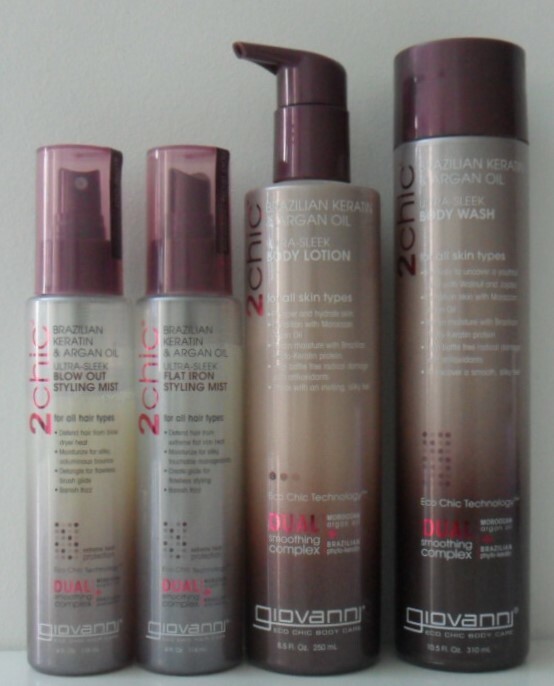 Initially, I only picked up the Giovanni 2chic Ultra-Sleek Blow Out Styling Mist but loved the scent of the Ultra-Sleek line so much that I went back and got the Giovanni 2chic Ultra-Sleek Flat Iron Styling Mist, Giovanni 2chic Ultra-Sleek Body Lotion, and Giovanni 2chic Ultra-Sleek Body Wash all purchased from Sultan Center (Soug Sharq). I believe I’ve also seen the Ultra-Volume (orange packaging) and Ultra-Moist (green packaging) available for purchase as well. As you can see from the semi-transparent gorgeous ombre packaging, I’ve already gotten some use out of both hair mists. Personally, I did not notice much of a difference between them. In hindsight, I really didn’t need to get both the Blow Out Styling Mist and Flat Iron Styling Mist because I believe they are essentially the same; They both protect the hair from extreme heat (much like a heat protectant would), they both “banish” frizz (doing the job of a serum) and they both hold your hairstyle in place (just like hair spray), all while smelling ridiculously good! If you’ll take a quick look at the ingredients, you’ll notice that both these mists are chock-full of beneficial ingredients (and they’re pretty high up on the list too). That said, these mists do contain alcohol (just an FYI for those who are trying to avoid alcohol in their hair care). Also, this stuff isn’t quite as fine of a mist as Bioderma Hydrabio Mist (hauled here) but it doesn’t sorta’ just spit at you like MAC Fix+ ( hauled here). I lurrrve this thing! Not because it moisturizes my skin. Not because of all the other good stuff in it, nor because of all the good stuff it does to my skin. I love the Giovanni Ultra-Sleek Body Lotion because it smells so good! Sure it makes my skin nice and soft (what lotion doesn’t do that?) but I’m more obsessed with its delicious scent! I’m pretty sure it’s the “Moroccan Argan Oil”. It’s a wonderful, warm, nutty scent that reminds me of chestnuts (or kastana in Arabic) roasted over an open fire! It’s everything I wanted The Body Shop Wild Argan Oil (hauled here) to be but unfortunately their version was just too perfume-y (floral-y even) for my taste. I’m so glad I went back and got this Giovanni Ultra-Sleek Body Lotion because now I don’t have to rely solely on the Giovanni Ultra-Sleek Blow Dry Mist for some Argan Oil-scented goodness. Also, I like that it comes with a handy little pump. I’m constantly applying the Ultra-Sleek Body Lotion now, just to get a hit of the gorgeous scent! This Giovanni Ultra-Sleek Body Wash however was a miss for me. I was so sure I’d love this the most out of everything but as it turns out… I’m actually scared of it. For some reason the walnut beads kinda’ freak me out, which is why I’m loath to use them on my body. The handful of times I did use this stuff, I noticed that the finely crushed walnut beads were too gentle to be of any actual use, which was a bit disappointing. As for the body wash itself (liquid part), forget exfoliating, this didn’t even cleanse my skin properly. To me, it felt like I was washing up using water (albeit slightly scented water… with little scary beads in it). The lovely Argan Oil scent was still there, only mixed in with some other soap-y scented stuff which overall wasn’t that bad actually. The flip-top cap was pretty handy too. I wanted to like this but unfortunately I didn’t (sorry!). I really like the philosophy behind Eco Chic and I love everything about the packaging on the Ultra-Sleek range; from the semi-transparent ombre (practical and pretty) sleek bottles (just like it’s namesake) to the Burgundy caps (so cool!) to all the clearly legible blather (name, benefits, how to use, etc..). I like both Hair Mists (even though I should’ve stuck with just the one) and I really, really like the Body Lotion (for a constant hit of that delicious, nutty Moroccan Argan Oil scent) but I did not care of the Body Wash at all. All the products were relative inexpensive and as I said earlier, can be found at Sultan Center (Souq Sharq).